Perhaps the least recognized and least appreciated triumph of the GOP Congress is the de facto spending freeze between 2009 and 2014. Fights over debt limits, sequestration, spending caps, and government shutdowns were messy and chaotic, but it’s hard to argue with the results. The burden of federal spending fell from 24.4 pct of GDP to 20.3 pct of economic output in just five years. So I was pleased to see this morning that the Wall Street Journal opined this morning on this success. …amid all the conservative denunciations of the John Boehner era, a key political fact is typically ignored. 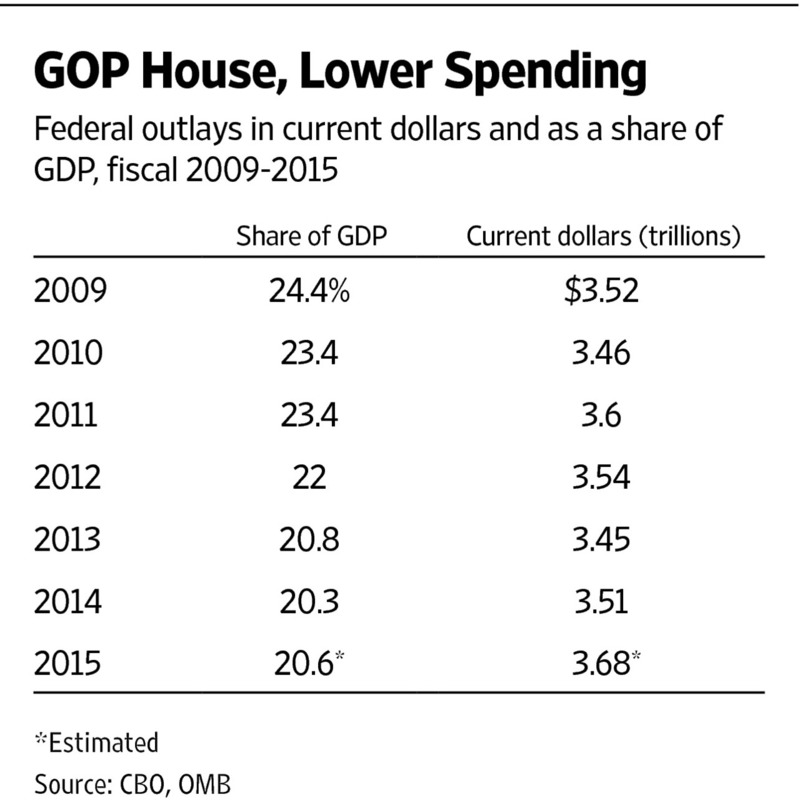 To wit, the GOP takeover of the House in 2010 has led to a marked decline in federal spending. …The stimulus boosted spending to a modern record of 24.4% of GDP in 2009… Then Republicans won the election in 2010 on a mandate to cut spending. …Total federal outlays fell two years in a row—from $3.6 trillion in 2011 to $3.45 trillion in 2013… The spending decline was even more marked as a share of the economy, falling for three straight years—from 23.4% in 2011 to 20.3% in 2014. This kind of spending restraint almost never happens in Washington…domestic spending fell by about 2.8% of GDP during the same period. The editorial specifically praises the spending caps that were part of the Budget Control Act, which are enforced by sequestration. …the discretionary spending caps and sequester included as part of the 2011 agreement…forced discipline that has kept a lid on spending-as-usual. 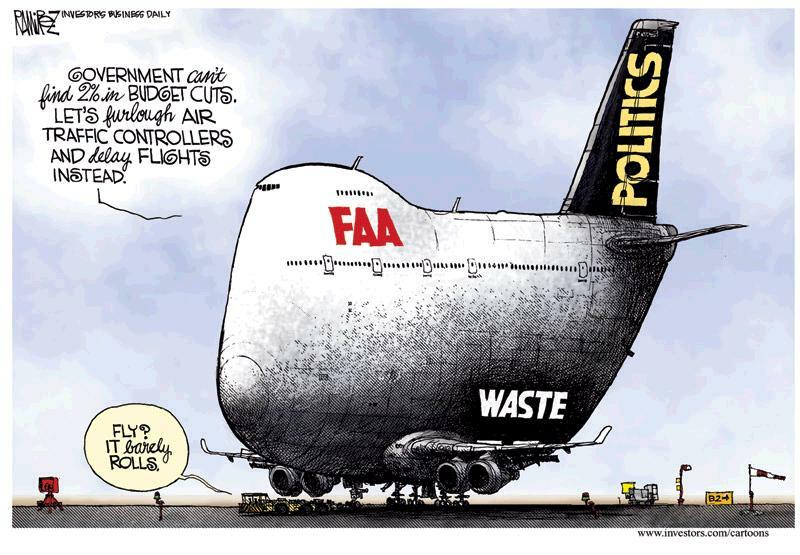 The lobbyists, special interests, bureaucrats, cronyists, politicians, and contractors in Washington hate budget caps and sequestration, but it’s been a big success. Writing for the Washington Examiner, Michael Barone makes a similar argument. 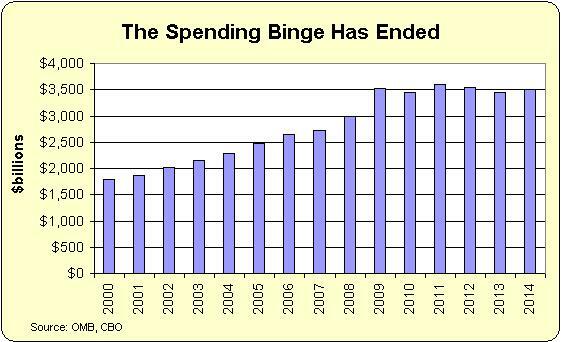 The hold-down of federal spending was accomplished by the sequester procedure which has stayed in place now for four years. It’s not the optimal way to form a budget. But if your goal is holding down spending — and reducing spending from 25 percent of GDP to 20 percent — then the sequester has been very effective. Now let’s consider some very good news. The Budget Control Act, along with the genuine enforcement mechanism of sequestration, is the law of the land. The growth of discretionary spending is capped not only this year, but also next year. And the rest of the decade. And even into the 2020s. But now let’s contemplate some very bad news. The pro-spending crowd in Washington has been working hard to weaken the spending caps and they may be on the verge of success. Congressional Republican leaders are launching budget talks with the White House. …News of the budget talks is already unnerving… House conservatives… GOP leaders are seeking to strike a deal that would set top-line budget numbers for the next two years. …A White House official said McConnell and Boehner reached out to Obama on Sept. 17. …A source close to McConnell said he hopes to secure a deal to increase discretionary spending for defense and nondefense programs in exchange for reductions to mandatory spending. Why are GOP leaders negotiating a new deal when there’s already a good deal in place for many more years? In part, it’s because many Republicans are big spenders, particularly for the defense budget. But part of the answer is that President Obama has threatened to veto any budget that doesn’t bust the caps. The President has even threatened to shut down the government to get more spending. And GOPers think they’ll get blamed, even though Obama is the one who would be reneging on the deal he agreed to back in 2011. Well, if Republicans don’t try (or don’t care) to make an argument for fiscal restraint, Obama will prevail. And the net effect will be a repeat of the so-called Ryan-Murray budget deal that weakened the spending caps back in 2013. That means more discretionary spending, accompanied by budget gimmicks and thinly disguised tax hikes. P.S. Some advocates of bigger government say sequestration would hurt the economy, but I challenge any of them to justify their Keynesian argument after looking at evidence from the U.S. and Canada in the 1990s. P.P.S. And if sequestration is bad, then why didn’t any of the President’s hysterical predictions become reality after the 2013 sequester? P.P.P.S. 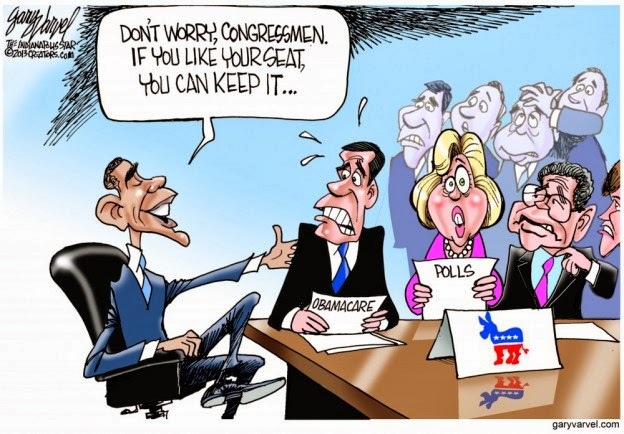 You can enjoy some good sequester cartoons here, here, and here. P.P.P.P.S. Here’s my contribution to sequestration humor. Are we about to see a new kinder-and-gentler Obama? Has the tax-and-spend President of the past four years been replaced by a fiscal moderate? That’s certainly the spin we’re getting from the White House about the President’s new budget. Let’s look at this theme, predictably regurgitated in a Washington Post report. President Obama will release a budget next week that proposes significant cuts to Medicare and Social Security and fewer tax hikes than in the past, a conciliatory approach…the document will incorporate the compromise offer Obama made to House Speaker John A. Boehner (R-Ohio) last December in the discussions over the “fiscal cliff” – which included $1.8 trillion in deficit reduction through spending cuts and tax increases. 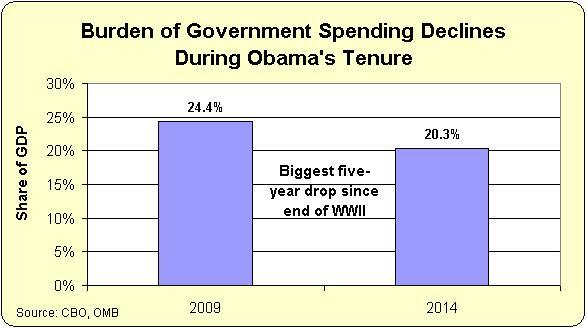 …unlike the Republican budget that passed the House last month, Obama’s budget does not balance within 10 years. Since America’s fiscal challenge is the overall burden of government spending, I’m not overly worried about the fact that Obama’s budget doesn’t get to balance. But I am curious whether Obama truly is proposing a “conciliatory” budget. Are the tax hikes smaller? Are the supposed spending cuts larger? Actually, there are no genuine spending cuts since the President’s budget is based on dishonest baseline budgeting. At best, we’re simply talking about slowing the growth of government. 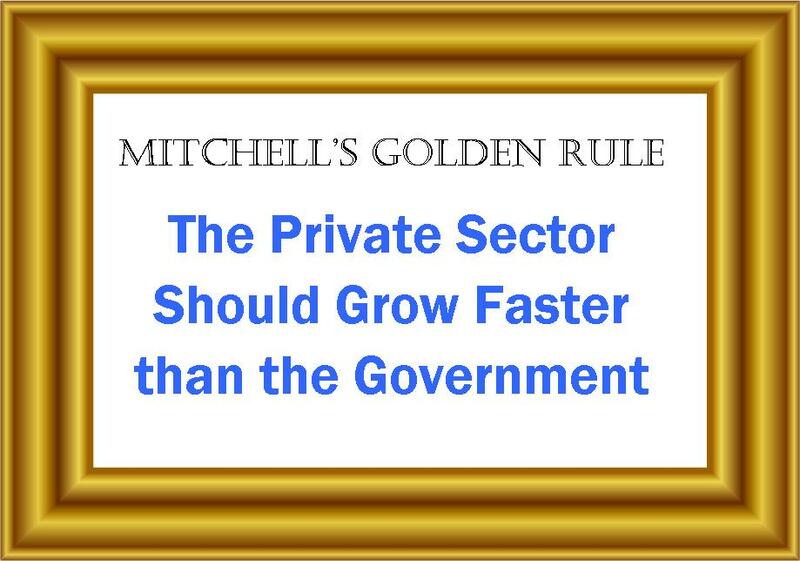 But since Mitchell’s Golden Rule is based on the very modest goal of having government grow slower than the private sector, it’s possible that Obama may be proposing something worthwhile. But possible isn’t the same as probable. Indeed, it appears that the budget is predicated on a giant bait-and-switch since the beneficial spending restraint imposed by sequestration would be repealed! 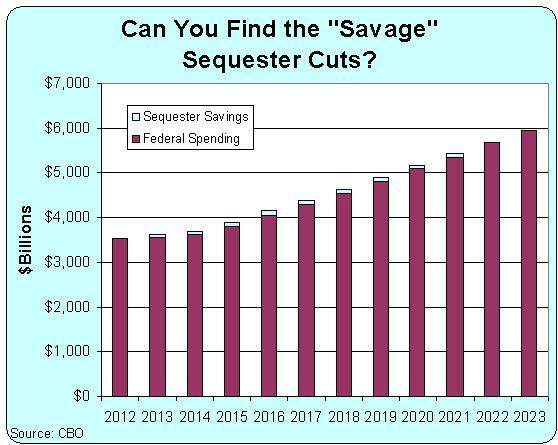 Obama’s budget proposal, however, would eliminate sequestration. This appears almost as an afterthought in the Washington Post article, but it should be the lead story. The White House wants to get rid of a policy that genuinely limits the growth of spending. We won’t have the official numbers until the budget is released next Wednesday, but I’ll be very curious to see whether the supposed spending cuts elsewhere in his budget are greater than or less than the spending increases that will occur if sequestration is canceled. Particularly since the President also is proposing lots of new spending on everything from early child education to brain mapping. Moreover, it seems as though Obama tax numbers are based on dodgy math as well. The White House is claiming that this is a “conciliatory” budget because he’s no longer proposing $1.6 trillion of tax hikes. The budget is more conservative than Obama’s earlier proposals, which called for $1.6 trillion in new taxes and fewer cuts to health and domestic spending programs. Obama is seeking to raise $580 billion in tax revenue by limiting deductions for the wealthy and closing loopholes for certain industries like oil and gas. Those changes are in addition to the increased tobacco taxes and more limited retirement accounts for the wealthy that are meant to pay for new spending. Let’s try to disentangle the preceding passage. The President wants $580 billion of new taxes from “deductions” and “loopholes.” But he also wants an unknown pile of revenue from new tobacco taxes and from restricting IRAs. And keep in mind that he already got $600 billion as part of the fiscal cliff. Until we get official numbers, we can’t say anything with certainty, but I’ll be checking on Wednesday to see how much revenue the President intends to grab as a result of the tobacco and IRA provisions. Suffice to say that I won’t be surprised if the net impact of all his tax hikes is close to $1.6 trillion. Especially since he’s also proposing to manipulate CPI data, a change that would generate another $100 billion in revenues. In other words, the revenue side of his budget likely will be a bait-and-switch scam, just like the spending side is a joke once you understand that he wants to get rid of sequestration. I hope I’m wrong, but I fear that my concerns will be validated next Wednesday and we’ll see another budget that has no real entitlement reform and more class-warfare tax hikes. P.S. The budget approved by the House of Representatives avoided any tax increases and restrained spending to that it will grow by an average of 3.4 percent annually. Not exactly draconian, but that approach does balance the budget in 10 years.